This project replaces the structurally deficient Los Carneros Overhead Bridge that spans over the Union Pacific Railroad line. 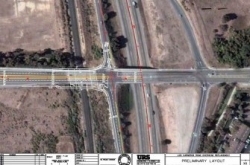 The new bridge will resolve capacity deficiencies for northbound Los Carneros Road to southbound onramp to Route 101, while enhancing bicyclist safety on the bridge. LEI is providing scheduling support as a subconsultant for MNS Engineers, Inc. for this $6.3M project.